For eight days Krakow, Poland’s second city and cultural capital, hosts the Misteria Paschalia Festival during Holy Week, on the days just preceding Easter, when the city is suddenly filled with Baroque music . In Poland Easter is the most important holiday in the Christian liturgical calendar. It is a time to hear great music linked to the Crucifixion and to the Resurrection of Christ. This year for the 13th time musicians gathered in this lovely Baroque city to focus on the suffering and joy of this emotional holiday. In the inaugural concert on 21 March we heard Haydn’s Die sieben letzten Worte unseres Erloesers am Kreuz (The Seven Last Words of Christ), one of the great pieces of Easter music. Arranged variously for string quartet, orchestra and voices, Haydn’s Oratorio “without words” is a meditation on the seven final statements uttered by Jesus as he was dying on the Cross. 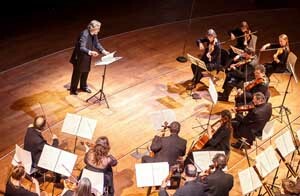 Image: Jordi Savall conducts the Concert Des Nations An unusual commission arrived for Joseph Haydn in 1783 from Spain while he was working for Count Esterhazy, one of the most prominent and wealthy patrons in the Austro-Hungarian Empire. The bishop of the Oratorio de la Santa Cueva, a church in Cadiz, asked him to write a series of orchestral pieces set to the last words Christ uttered on the Cross. Haydn called these pieces “sonatas”, each only seven or eight minutes long, with an opening introduction and concluding with a terremoto or earthquake. The music was punctuated by seven “discourses” read by priests. Haydn claimed “The Seven Last Words of Christ” his most successful composition. For this performance, the Catalan master of the viola da gamba and early-music pioneer Jordi Savall conducted his period instrument ensemble, Le Concert des Nations. Italian music of 17th and early 18th centuries reached its high point in the works of Alessandro Scarlatti (father of the more famous Domenico). A native of Palermo, Alessandro was maestro di cappella to Queen Christina of Sweden in Rome from 1680 to 1684 before accepting the same position at Santa Maria Maggiore. A papal decree in 1698 banned opera and theatre performances and thus made it necessary to disguise all dramatic compositions as oratorios. The librettos therefore often remained in Italian, the language of opera, rather than the more usual Latin. On Tuesday, March 22, Rinaldo Alessandrini and the Concerto Italiano presented Alessandro Scarlatti’s Cain, overo il primo omicidio written in 1707 and intended as religious entertainment for his listeners. An oratorio for six voices, the music retells the Biblical story of the murder of Abel by Cain, a tale of jealousy, remorse, sin and repentance. The slaying of Abel is the first murder in history. Adam and Eve mourn their fall and subsequent expulsion from Paradise. Abel, to pacify his parents, promises to sacrifice a lamb to God, but Cain, as the elder claims it as his right to perform this deed. With jealousy driving him mad, Cain listens to the voice of Lucifer encouraging him to kill Abel. Once the deed is done, Abel in heaven praises the joys of Paradise, Cain repents and God promises salvation. Sonia Prina The spirited performance took place in the Karol Szymanowski Philharmonic Hall. The singers were contralto Sonia Prina (Cain), soprano Minoca Piccinini (Abel), soprano Roberta Invernizzi (Eve), tenor Carlo Alemanno (Adam), counter-tenor Aurelio Schiavoni (God), and bass Salvo Vitale (Lucifer). Sonia Prina, well known in the world of opera, was a dramatic and blazing Cain full of the flamboyance and colour of Venetian opera. Carlo Gesualdo, an eccentric Italian prince and one of the Renaissance’s more innovative composers, is best remembered for killing his wife and her lover. It seems that he then spent the rest of his life attempting to atone for his sin by building chapels in which prayers were to be said and religious music to be played. His passion and madness were reflected in the mostly unaccompanied vocal music he composed, such as the Tenebrae, the anguished sacred texts and prayers used in the Catholic mass, conveying the emotions of the betrayal, suffering and death of Christ. The Tenebrae Responsories, a cycle of nine madrigals retells the story of Christ’s passion and shows Gesualdo’s tortured mind at work. The dramatic service was presented on 23 March at St.Catherine’s Church by Capella Cracoviensis conducted by Jan Tomasz Adamus. This ancient service makes use of gradually diminishing light through the extinguishing of candles to symbolize the emotional events of Holy Week. In the end only one candle (the symbol of Christ) remains in the sanctuary, a fitting end to the troubled events. The Oratorio di Sant’Antonio, an almost unknown work by Michele Falco, a nearly forgotten Neapolitan late 17th-early 18th century composer is, as far as we now know, all that survives from his pen. An impassioned performance of the piece was given on 24 March in the Krakow Philharmonic by Europa Galante conducted by the outstanding violinist Fabio Biondi. One of the most important musicians of Baroque repertoire, Biondi is also a fervent researcher trying to rediscover minor early composers. Soloists were mezzo-soprano Cecile van de Sant (Antonio), mezzo-soprano Lea Desandre (Angelo), mezzo-soprano Martina Bell (Penitenza) and soprano Giulia Semenzato (Gesu). On March 25, Good Friday, thoughts are generally focused on the martyrdom of Jesus. Mark Minkowski leading Les Musiciens du Louvre Grenoble and the Cor de Cambra del Palau de la Musica Catalana gave a stirring performance of Wolfgang Amadeus Mozart`s magnificent Requiem in the Ice Krakow Congress Centre. I have learned to expect the unexpected from Minkowski, a French early music expert. Before even a note was heard, he asked the audience to stand a moment in silence to mourn the victims of the Belgian terrorist attack which happened three days earlier. I recall a similar situation on Jan.27 2015 in Salzburg during Mozartweek when Minkowski also asked the audience to stand in silence, not in memory of Mozart`s birthday but to remember the liberation of the Auschwitz Concentration Camp on this same day in 1945. In both cases it was only after the collective silence that the music was allowed to speak. On March 26 an unusual early work was presented, Membra Jesu nostri, a cycle of seven short cantatas for voices and period orchestra, meditating on the different parts of Christ’s body by Dietrich Buxtehude (1637-1707). The text is strange for a Lutheran composer for it is based on Rhythmica Oratio, a collection of hymns which address the parts of the crucified body of Christ hanging on the cross. The work is attributed to the 12th century mystic Bernard de Clairvaux who was held in high regard by Martin Luther. The seven parts of Christ’s body (hence the title “the limbs of our Jesus”) are seen from the perspective of someone standing at the foot of the cross looking up. First you see the feet, then the knees, hands, side, breast, heart and finally, the face. Each cantata is linked to a Biblical passage, which refers to a particular part of the body. The work was played by the ensemble Vox Luminis led by Lionel Meunier. It was complemented by Agostino Steffani’s Stabat Mater. 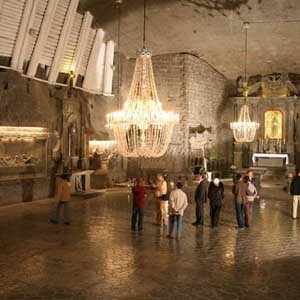 The setting was the extraordinary St.Kinga’s Chapel at the Wieliczka Salt Mine. The descent was earlier made on 367 wooden steps, but today life is somewhat easier and we are lowered by three mineshaft lifts, an adventure for the courageous but not for the claustrophobic. 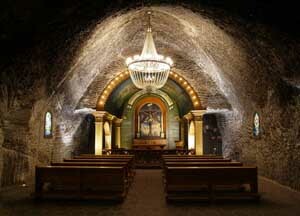 Image: Wieliczka Salt Mine - R Stachurski Salt has been produced here since the 1200s. In the 1800s the miners started to carve underground chapels and to create salt sculptures, salt chandeliers and salt bas reliefs. During WWII the 300 km of tunnels were used by the occupying Germans as an adhoc facility for war-related industries. The air is said to have large quantities of sodium, magnesium and calcium ions which help the respiratory system. In fact the air is so therapeutic that something called ‘subterrano therapy’ is offered in the underground mining tunnels. The Treatment Salt Chamber even features an underground hotel. For the closing Easter Sunday concert we heard Belshazzar (1744), one of the last oratorio’s by George Friedrich Handel, which recounts the Biblical story of the despotic Babylonian king who dared to defy the God of the captive Israelites. The music was conducted by Ottavio Dantone leading the Accademia Bizantina orchestra and Capella Cracoviensia Chamber Choir. The soloists were the Scottish tenor Thomas Walker (Belshazzar), soprano Rosemary Joshua (Nitocris), countertenor Filippo Mineccia (Cyrus), contralto Delphine Galou (Daniel) and bass Andreas Wolf (Gobrias). The setting is the city of Babylon in the year 539 BC where King Belshazzar is under siege from Cyrus, Prince of Persia. The king’s mother Nitocris and the prophet Daniel have a grim foreboding that the city will fall. And that is exactly what happens during the hour Belshazzar and his drunken troops are celebrating the feast of Sesach, the god of wine. In the end Cyrus captures the city and liberates the Jews from slavery, promising to build a new Jerusalem. In reflecting back on the seven concerts I heard in Krakow, I begin to realize how much diverse music existed during and before the time of Bach. Perhaps the Swedish poet and philosopher Lars Gustafsson had it all wrong when in one of his poems entitled The Silence of the World Before Bach, he laments that “there must have existed a world before the Trio Sonata in D” and wondered what that world was like. Was it a world of “unresonating spaces and unknowing instruments,” a world of “lonely remote churches” where all you heard was old woodcutters and their axes? “Where Bach was nowhere?" Now after seven days in Krakow listening to some oustanding Baroque Easter music, I can have little doubt that a vibrant musical world existed even before the A minor Partita. Music lovers from around the world gather in Cartagena, Colombia, for the annual International Music Festival. Renowned musicians from across the globe fill the city’s plazas, churches and theatres with music.